BY AIR, LAND AND SEA! The Mighty Ninth moved by Chinooks, Skycranes & Road Convoys....and an LST! photos contributed by redleg artillery surveyor Robert "Bob" Wilson. Below are comments / memories about the "RSOP by sea"
I have some photos of the 2/9th loaded on an LST. As my memory serves, we made a sea move from Qui Nhon to Duc Pho. I somewhat remember going by convoy in Jan 67 from Pleiku to Qui Nhon. Then the division split with some continuing by convoy and some by sea to Duc Pho. What I remember is that I went by sea and the trip was rough due to the flat bottom of the LST (LST 626). I recall standing to get a better view and the ship came down off a wave and buckled my knees. I then climbed into the cab of a truck on the deck for the remaining trip to Duc Pho. Since my memory is so vague, I was wondering if anyone else remembers the sea move and could fill in more of the trip. On the deck photo you can see the designation 25-2F9. It was probably the BN HQ that went by sea since the Survey section was part of HHB. I also read an after action report, and it mentioned that the battalion went by both land a sea. I was hoping that I could get a validation by someone else that went be sea. I have the photos but I'm questioning my vague memory of the move by sea. I got together with another artillery surveyor last year, and he has no memory of going by sea. I'm going to try and find that after action report again. The 3d Bde, 25th Inf Div was part of Task Force Oregon. They were given the task of securing Highway 1 from Qui Nhon north. The VC were blowing up bridges as quickly as they were being rebuilt. So when the unit was to moved to LZ Montezuma to avoid the damaged bridges. What could be moved by air was airlifted, and what couldn't be moved by air, trucks for instance, went by sea. This is solely my speculation based on a letter Danny Yates wrote home about a sea and air move and an article he found. from Lt Dean Gary Springer:I remember well the move from Pleiku to Duc Pho. I was XO of Alpha battery at the time. Our part was strictly by convoy. What I have no memory of is any part of a sea move. My best guess would be that it was the Bn HQ that went by sea. from Sgt Ray Delano:I looked at the Texas Tech University virtual Library on Vietnam and this move is in a after action report, only I forget which one. But, it is there and I think it said "A" Battery made the move with some Engineer and Cav unit . I came across an After-Action Report for April - May of 1966. 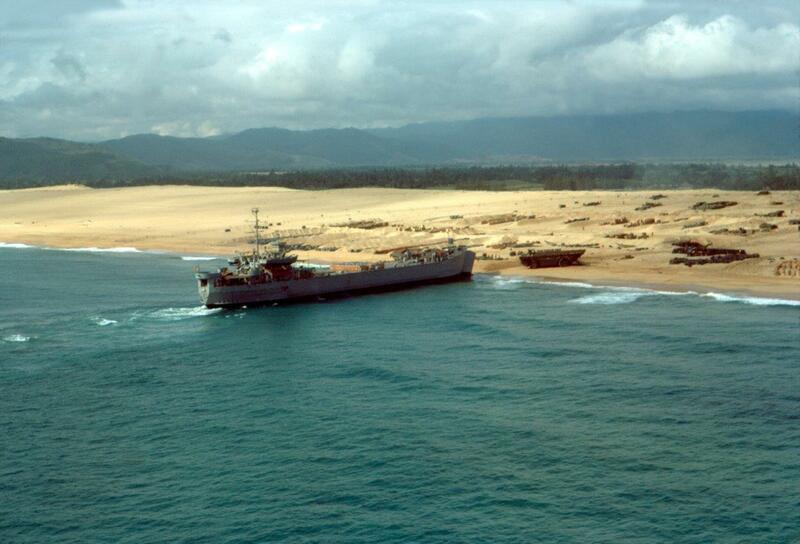 Above is a picture of an LST unloading ammo at the ammo dump on the beach at Duc Pho. I set out to identify the ship, but noticed that the numbers on the ship are black (very hard to see) instead of the usual white letters the navy uses. It turns out there was the Military Sea Transportation Service (MSTS) that a lot of WWII LST's were assigned to. Notice in Bob Wilson's photo that the letters are black, too. Neither LST is armed---most LST's of the Navy had 20mm cannons fore and aft. I actually tracked down and called two navy veterans who served aboard LST's in Vietnam in 1967 to get more information. I also learned that there are only 2 LST's left, and they are both museums, one in Muskegon, MI and the other in Evansville, IN. An LCVP discovered at Normandy is currently being restored for Cantigny Park, a first division museum only a couple of hours away from me. I'm planning to visit the LST museum in Evansville next month, as soon as weather permits. In the end, I'm pretty sure the LST at the beach at Duc Pho is LST-715, but I'm still trying to get verification of that. from Lt Dennis Dauphin, Webmaster:Danny Yates' theory is very plausible. I don't recall any water route from Qui Nhon to Duc Pho; more likely it was the South China Sea. I know there was Hwy 1 and Hwy 19 that we used in connection with Qui Nhon, Pleiku and An Khe. Hwy 19 went through the Mang Yang Pass. No water routes there. On the other hand, I have received contributed photos of Bronco Beach and some 2/9th cannons sitting in the sand (weird sight that is). Since I was there, I do know that we left LZ Uplift to go to Duc Pho ("A" Battery) and sit atop LZ OD. I know that I didn't ride an LST to make the move and may not have really cared how the guns got there. But, you have some great historic shots nonetheless. Everyone, of course, can recall the Chinooks and the SkyCranes moving our 105mm howitzers. So many photos of that...for obvious reasons. Speaking of LSTs, does anyone remember the “Rocket Ship” which was in support of 3rd Brigade Task Force, 25th Div? If memory serves (always a shaky premise), she was the United States Ship St. Francis River and she was a “Landing Ship Medium Rocket”. Her Radio call sign was “Dear Abby” and the Skipper was “Abby Tango”. He was a big tall Navy Full Lieutenant. There was a liaison officer at the Brigade TOC. Her main battery armament was (lots of) 5” rocket launchers. She also had a big Five Inch 38 gun, lots of lesser cannons and even a four-deuce mortar or two. The ship was capable of what might be called area fire. “Shooting the Boat” required suitable targets such as (large areas of) terrain in the open. I remember hearing an exchange one night on F1 (I think). A swift boat had illuminated the Ship and Abby Tango invited it to do it again and observe him firing all his weaponry at once - at the swift boat. For some reason the swift boat declined the offer.